Another in the line of Kelsey presses, though this one is called a Victor. The only side-lever press made by Kelsey, it was also made with a 5″x8″ chase. William A. Kelsey began making inexpensive presses for amateurs in 1872. 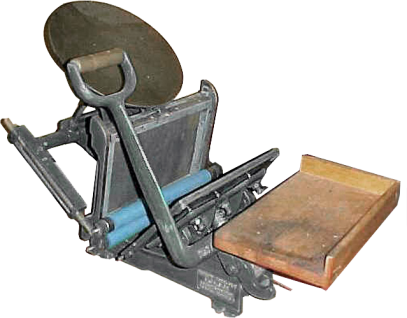 His Excelsior became the longest-lasting press on the market. For more information on Kelsey presses, see the Excelsior 3×5 page.